this was a guys argument about if we did or didnt land on the moon. I know its prolly been talked about but what do you guys think about it? I think it would have been harder to pull off a hoax of this magnitude than it would have been to just go to the moon. Then again, NASA does have a way of doing things the round-about way. Take for example the pen NASA spent millions of dollars developing, that would work in space; the Russians used pencils. Spelling stuff right is cool. we landed on the moon. deal with it. I recently started to question the authenticity of the moon landing. My biggest reason is due to the loss of bone density/muscle tissue all astronauts suffer after just a few days in space. The Russians sent people up and after 5 days they had lost so much bone density and muscle that they couldn't even walk, sit up etc. I believe the moon landing was 7 or 8 days total and I have never heard of any reports that they suffered this type of physical stress. They also appear happy, healthy and holding themselves up just fine in the pictures in the quarantine trailer. If anyone has any info about their physical state could you please let me know? Another aspect of the moon landing that has always made me wonder a little bit is the radiation of the Van Allen Belt, which Nasa claims is harmless. This just seems a little fishy to me. But I really can't say that it didn't happen. I need more concrete evidence. We landed on the moon. Conspiracy theories, lol, maybe there is no moon and the earth is hollow, too... Not even going to the moon themselves would satisfy the people who think it never happened. I think much of it depends upon whether it is possible to get through the radiation belt without being fried. If it is not possible, without heavy lead shielding, then we did not go there. Whenever this particular point is brought up so as to settle the argument once and for all, why is it always skirted and the subject is quickly changed? If they had put heavy lead around the entire missile, it wouldn't even have launched. Why, when Bart Sibrel just asks the astronauts to place their hand on the bible and say they went to the moon, do they take off running with hands in pockets? Why not just do it and let that be the end of it? Why punch him in the jaw or kick him in the rumpus? Apart from all this, unless any one of us was actually there [on the Moon] on that day/ night, to see whether they landed or not, we cannot say unequivocally whether it happened or not. All we can do is take a "side" because of a certain so-called loyalty of some kind. The strangest part of it all to me was their press conference right afterwards. They weren't the least bit excited, though one would think they could never have been MORE excited in their whole lives, and they kept giving each other "looks" as if to check their stories with one another before answering questions. I had just gotten married that year, and the whole thing was entirely strange; like a diversion against the Viet Nam war. LOL....yes...but, I would like to point out, that NASA's favorite line is "It would be harder to pull off the hoax." When that is not true in the least. I watched a program on tv, where they were trying to "prove" that the pictures were NOT faked, that they were real. They went to the desert "near area 51", and they took the pictures, proved that you wouldn't see any stars, that the shadow's were the same, well...to me...they just showed me that in 2 hours, (an extra for the 1 hour photo) they managed to prove to me that it was entirely possible, and that it was extremely probable that it was a hoax. Uhmanduh, I have to agree with you about the loss in bone density and muscle. It doesn't make any sense at all, if they were in space longer for the moon landing, then the Russians, then why were they sitting up just fine in the life rast just after "re entry"? The topic has been addressed ad nauseum in the past, but since there are a number of new members who may not have participated in past discussions, this will be allowed to progress for now. The thread will be watched closely, however, to insure that the subject doesn't become repetitive and unproductive. In the meantime it will be moved to the correct category. I recently started to question the authenticity of the moon landing. My biggest reason is due to the loss of bone density/muscle tissue all astronauts suffer after just a few days in space. The Russians sent people up and after 5 days they had lost so much bone density and muscle that they couldn't even walk, sit up etc. This is just plain wrong. Bone density issues only become a problem on missions lasting several months. Russian Cosmonauts have been able to walk within 24 hours of long duration missions lasting up to 400 days. NASA has never claimed that the van Allen belts are harmless, however the short amount of time the astronauts spent passing through the belts was insufficient for them to be exposed to a harmful dose of radiation. Radiation damage depends on two things, the strength of the radiation and the amount of time you are exposed to it. The strength of the van Allen belts is no secret. If you have satellite TV you are receiving a signal from a satellite in a geosynchronous orbit, 22,500 miles above the earth. That satellite and all the others that handle TV, telephone communications and some weather satellites have all passed through the van Allen belts. If the radiation was intense enough to fry an astronaut don't you think that the engineers that built these satellites would have noticed. Great story, but that is actually a myth. The space pen was developed by Fischer, and the pens were sold to NASA at the princely sum of $2.95 each. They were also sold to the Russians. Until the space pen came along (about 1967), NASA also used pencils. No development money was paid by NASA to the company. My biggest reason is due to the loss of bone density/muscle tissue all astronauts suffer after just a few days in space. The Russians sent people up and after 5 days they had lost so much bone density and muscle that they couldn't even walk, sit up etc. I believe the moon landing was 7 or 8 days total and I have never heard of any reports that they suffered this type of physical stress. They also appear happy, healthy and holding themselves up just fine in the pictures in the quarantine trailer. If anyone has any info about their physical state could you please let me know? The lunar missions were up to about 12 days in duration. The longest was Apollo 17 at 12 days, 13 hours, 51 mins. Before Apollo, there was a long duration flight to examine this very issue; it was Gemini VII, and lasted 13 days, 18 hours, 35 mins. Problems with extended stays in zero-G is indeed a problem - but not an insurmountable one. Part of the answer is exercise. Have a look at the durations of the Skylab / Salyut / Mir flights; they were a lot longer than Apollo. Here is a good PDF paper about the problems associated with bone / muscle loss during space travel. I'm always reminded of Borman & Lovell from Gemini VII, and the way they walked when they were aboard the recovery carrier. As Jim Lovell says, they looked like they had pooped their pants! It was having to get used to the gravity again. There is a video of them aboard the carrier; I'll see if I can find it and post the link for you. Hi Swandancer! I wouldn't say it is skirted; the problem is that it is a very complex subject that a lot of us don't have the necessary understanding of. As others have said, the short duration for exposure to the Van Allen Belts and adequate protection from cosmic radiation reduced their doses to acceptable levels. In fact, the Skylab and Mir astronauts / cosmonauts received higher doses than the Apollo astronauts. This is a good explanation of the radiation problem and why it is not proof for an Apollo 'hoax'. That is a very often-asked question, and a quite understandable one. It has to do with the despicable methods Mr Sibrel has used to gain access to the astronauts and his treatment of their answers. Put bluntly, he lies about why he wants to interview them. He has used false pretenses (claiming to be from educational networks, etc) in setting up interviews. He has stalked astronauts. He even shows that after astronauts accede to his demands, he calls them liars (Al Bean, Ed Mitchell). When he asked Buzz Aldrin to swear on the bible - and that if he did, Mr Sibrel would give $500 to an honorarium of Buzz's choice - he intended to then claim Buzz has lied (this was revealed by Mr Sibrel himself - under oath - after the famous 'Buzz Punch' incident) and the money was obtained under false pretenses. Let me put a hypothetical to you. I have no idea what your profession is, but let's say you are an artist - a quite famous one. An interviewer asks to talk with you on camera about your work. You agree. They start quite normally, but then claim all your work is a fake - that you never painted the artwork you are famous for. They demand you swear on the bible that you did indeed paint the work, and that it is entirely yours. You agree, and swear on the bible. The interviewer then claims that your "swearing" was just another example of your deception, that it was just another lie. Do you think you'd be calm & collected with this guy? When he had pulled the same stunt with other artists? That's a pretty fair point. Unless we were actually there, we can't - but it doesn't have to be because of a 'loyalty'. What we can do is look at the technology involved, the environmental factors, and the data returned from the missions. This has been evaluated by many scientists around the world, and has indeed been used as the basis for future missions. People study this stuff - and none with the requisite expertise in the individual fields have any doubt that it was capable of doing the job. We can look at the biology / radiation problem. We can look at the aerospace design problem. We can look at the computer technology problem. We can study the returned lunar samples. If you still have doubts, you should scout around your local universities for some experts in the fields - computers, biology, astrophysics, nuclear physics, mechanical engineers, aerodynamic engineers, etc. Ask them - was this possible? Why? Then get another person in that same field and ask them the same question. So, we cannot say we saw it ourselves (except for a privileged few) but we can confirm that everything associated with the missions were indeed possible. If you have a look immediately after the missions, they are most certainly euphoric. Later during the press conferences (for the earlier missions), they had been quarantined for some 21 days, unable to touch their loved-ones, having blood samples and medical checks performed, being isolated from everyone. They were tired, maybe a little depressed that they had completed an achievement of a lifetime - and what could top that? I was wondering, if Neil Armstrong was the first man on the moon, then who was video taping him when he came out of the lunar module? There is a little known invention called remote control. I have also thought about that. They were said to have installed a television camera into the side of the lunar module. 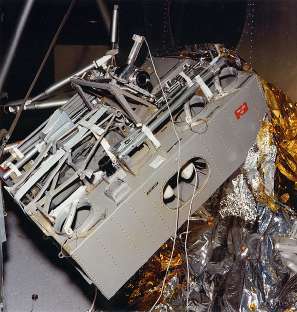 There was no protection at all for this electronical equipment from the Van Allen Belt. Even today, our satellites are protected against the radiation from the Van Allen Belt, and they are still shut off when they are near it. I'm confused as to how then, could this camera have survived the trip. How did the camera, that the little known invention called the remote control controlled, survive the Van Allen belt? They were in the van allen belt for only a split second (when your travelling at that kind of speed you can only be anywhere for a split second! )...not long enough to fry anyone or anything. And the lack of gravity wouldnt really effect you after only a few days....as has already been stated both russians and americans(and at least one brit iirc) stayed up for over a year on MIR etc and didnt have much trouble when they got back. Torchwood, my dear. On Wikipedia, (yes I know LOL).....it states that the radiation will still stick to everything, and penetrate the rocket. hmmm... I also have an article...that states with no exercize, being up in space, that after only a few days, the muscle mass can be reduced 30%. (some people more, some people less). I'm sorry if I'm not making too much sense, I'm a bit tired. Here's the link to the NASA article though. It wasn't a remote control actually, it was activated by Neil Armstrong pulling a lanyard which opened the MESA. The camera had already been pre positioned to point that the ladder, it's in the Press Briefing pack I have if anyone wants to see it. Ok it can pentrate the rocket but Van allen himself reckoned the astronuts would only get a mild dose (it says that on wiki as well!). As far as I can see the amount of radiation involved means youd have to stay in the belts for about 5 or 6 months before you'd recieved the 1000rads neccessary to kill you. Apollo went thru the narrowest part and was only there for a few seconds. And wheredid u find the bit about it sticking? I never knew that, what does it stick to, and how? Can you accumulate it like gum on a shoe? I forget now what he astronuts had onboard apollo but Im sure they had some training techniques that work in space....most of the space stations have an onboard gymnasium! Anyway astronuts tend to be physically very fit, so can probably quite easily survive a fair bit of loss of mass in their muscles. Nasa had a few years of practice to c how space and zeroG effect the human body and Id be surprised if they hadnt learnt how to compensate for it.